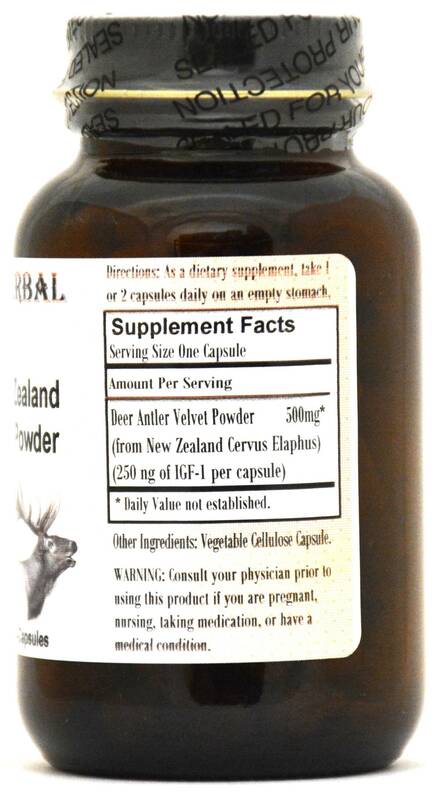 Barlowe's Herbal Elixirs now offers highest quality Standardized Deer Antler Velvet Powder derived from Red Deer humanely pasture raised in the pristine hills of New Zealand. This superb supplement is standardized to a minimum of 250 ng of IGF-1 per 500mg capsule. Bottled in Glass! No Stearates! No Fillers! No Junk! 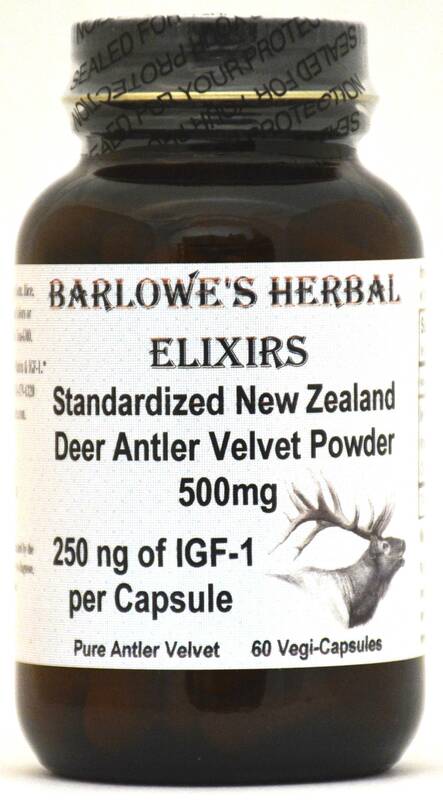 Barlowe's Herbal Elixirs now offers highest quality Standardized Deer Antler Velvet Powder derived from free grazing Red Deer humanely raised in the pristine hills of New Zealand. This superb supplement is standardized to a minimum of 250 ng of IGF-1 per 500mg capsule (500 ng of IGF-1 per gram). Thus, each bottle of 60 capsules delivers 15,000 ng of IGF-1. This antler velvet is also 53.59% protein, and contains 40 key compounds and 400 active ingredients, including the full growth factor matrix. It is produced by a specialized freeze drying process which preserves the active ingredients, and especially the growth factors. 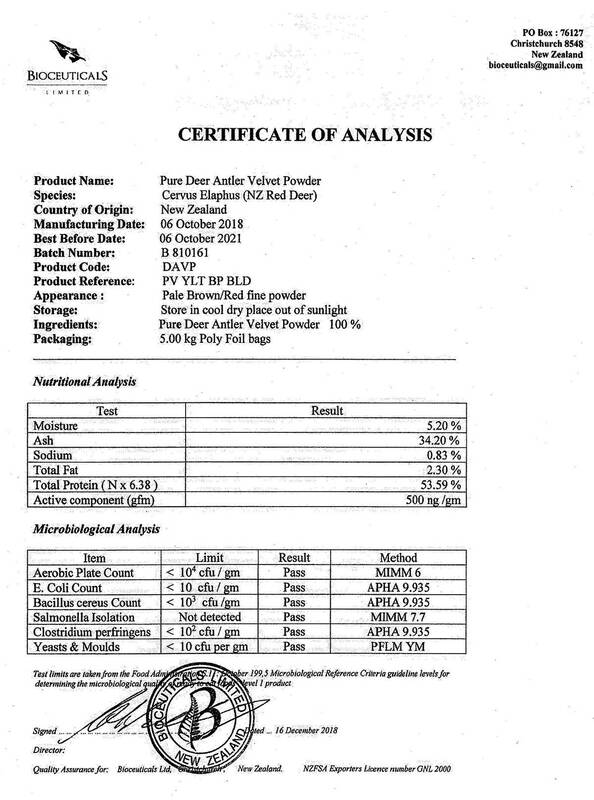 The Deer Antler Velvet Certificate of Analysis (COA) of this particular batch is shown above. Bottled in Glass! No Stearates! No Fillers! No Junk! Deer Antler Velvet Powder is well known for its powerful rejuvenating qualities. It has been prized in Chinese medicine for millennia, and it is the second most popular herbal remedy in Asia. Deer Antler Velvet is harvested for its medicinal and performance qualities from early season deer antlers. The deer are not harmed by this procedure, and the herds utilized for this product are routinely screened for disease, agricultural and chemical contaminants.They live long, happy lives. Caution: Studies have shown that Deer Antler Velvet is generally safe, but it should be utilized with care. This product is for dietary use. If unexpected side-effects occur, discontinue use immediately! For more information, contact Barlowe at BarlowesHerbalElixirs.com. The above statements have not been evaluated by the Food and Drug Administration (FDA). This product is not intended to diagnose, treat, cure, or prevent any disease. Directions For Use: As a dietary supplement, take one capsule once or twice daily without food.